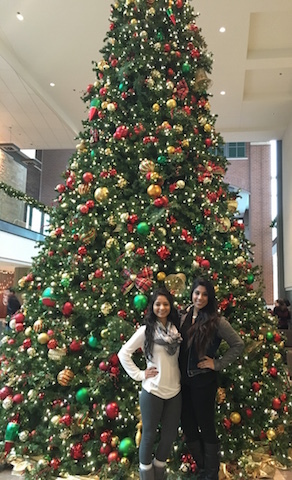 There are endless ways to enjoy the holidays on campus and around Chicago! Grabs your coats, scarves and gloves and join us the Loyola alumni, staff, and students in some holiday fun! 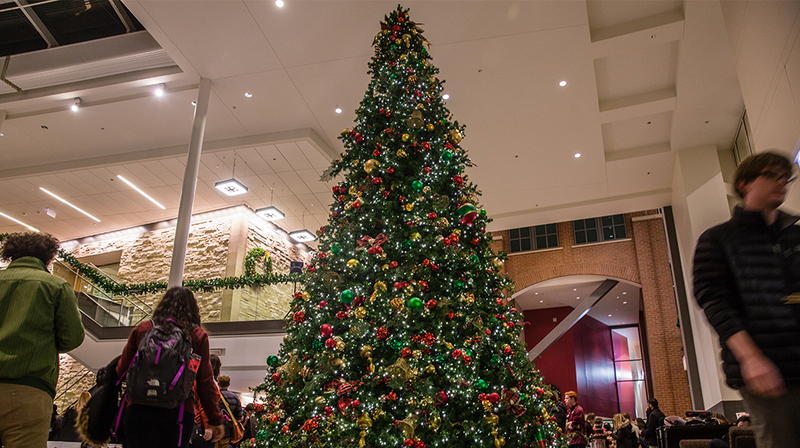 Start the Christmas season at Loyola with the annual tree lighting celebration in the Damen Student Center. Bundle up and get ready to belt out some holiday classics during Caroling at Cloud Gate in Millennium Park. This festive series is part concert, part sing-along at the world-famous Cloud Gate sculpture, also known as “The Bean.” 201 E. Randolph St.
Head to the Lincoln Park Zoo for a fun, free, family-oriented holiday celebration, featuring luminous displays and holiday activities throughout the grounds. 2200 N. Stockton Drive. Dec. 3, 12 – 8 p.m.
Dec. 4, 12 – 6 p.m.
Polar Palooza, the annual two-day outdoor winter festival for Chicago’s North Side neighborhoods, is back and co-hosted by Loyola University Chicago, the Rogers Park Business Alliance, the Edgewater Chamber of Commerce, and Alderman Joe Moore of the 49th Ward. Enjoy food from local restaurants, live music, synthetic skating, a meet-and-greet with Santa, and—on Sunday—a visit from a live reindeer. New attractions this year include a beer garden, holiday movies at The New 400 Movie Theater, and a merry-go-round. 6601 N. Sheridan Road. Operated in conjunction with the Catholic Charities: Sponsor-A-Family program, Loyola Gives sponsors families by raising funds and purchasing needed items and gifts for the holidays. Dec. 8, 5:15 – 6 p.m. The Feast of the Immaculate Conception is a holy day for those who follow the Catholic tradition. Come celebrate Mass at Madonna della Strada Chapel. Dec. 8, 7:30 – 9:30 p.m.
Joyola! returns this season for a grandiose evening of holiday celebration showcasing a mix of sacred and secular works. The night will feature performances by the Wind Ensemble, Symphony Orchestra, Women’s Chorus, University Chorale, Chamber Choir, and Jazz Ensemble. Mundelein Center. 1020 W. Sheridan Road. Dec. 9, 5 – 7 p.m. Need a break from studying or just a few sweets in your life? Students, faculty, and staff are invited to Student Diversity and Multicultural Affairs’s annual event for holiday treats. Damen Student Center, Sister Jean Dolores Schmidt, BVM, Multipurpose Room. 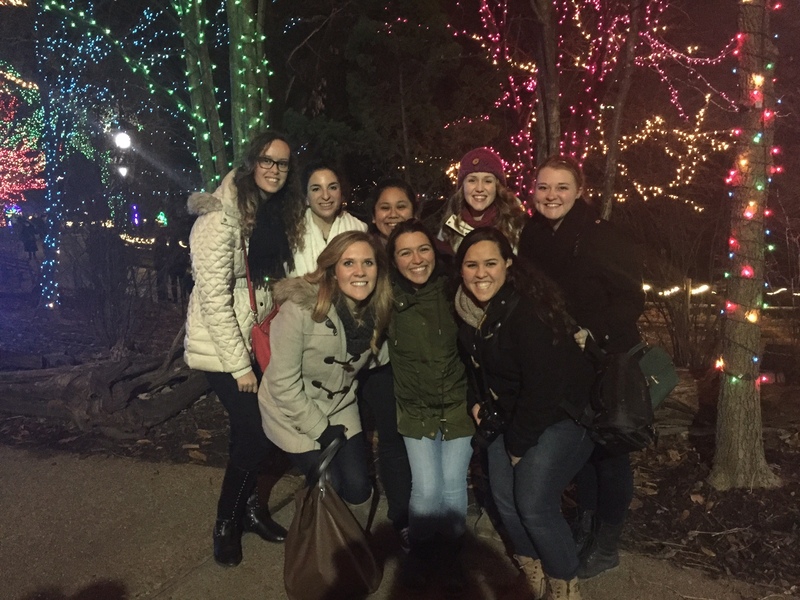 Join Mundelein alumnae and friends to celebrate this Advent-Christmas season. We will begin the evening with our tradition of Advent Vespers followed by a reception, and then we will enjoy Lessons and Carols, the Christmas mystery presented in song and scripture. Piper Hall. 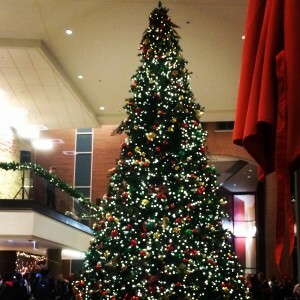 Loyola’s most popular holiday event returns. In the tradition of A Festival of Nine Lessons and Carols, the world-renowned Christmas Eve worship service at King’s College Chapel, this service features a series of lessons juxtaposed with liturgical music performed by the University’s choral ensembles. Madonna della Strada Chapel. This free late-night breakfast for students is a Finals Week tradition at Loyola. Finals Breakfast provides students a chance to take a study break, refuel, and catch up with friends before the last stretch of exams. Faculty and staff serve students meals to provide support and boost morale during this stressful time of the semester. Gentile Arena. Hosted by GOLD (Graduates of the Last Decade), this event features a morning of crafts and activities to celebrate the holidays. A continental breakfast will be provided and Santa will be ready for pictures. Please bring an unwrapped toy to donate to Family Matters of Rogers Park. Damen Student Center, Sister Jean Dolores Schmidt, BVM, Multipurpose Room. Each year, people from all over the world visit the Christkindlmarket in Daley Plaza in downtown Chicago. The unique shopping experience—paired with traditional German food, drinks, and entertainment—makes the market a must-see for the holidays. 50 W. Washington St.
For the 16th year in a row, families from near and far will flock to Navy Pier and bask in seasonal bliss without bundling up. The PNC Bank Winter WonderFest returns with more than 24 rides and attractions and 170,000 square feet of indoor entertainment for all ages. 600 E. Grand Ave. 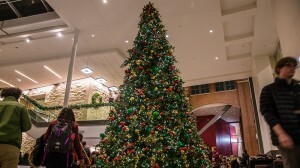 This holiday staple at the Museum of Science and Industry features international Christmas decorations—and even indoor “snow.” Guests can celebrate festive traditions from around the globe with a forest of beautifully adorned trees, each one decorated by local volunteers from Chicago’s diverse communities. 57th Street and Lake Shore Drive. Tis the season to celebrate everyone’s favorite “Peanuts” pals as they dig past the commercialized gimmicks of presents and decorations to rediscover the true meaning of Christmas. Through a pageant and a spindly tree, Charlie Brown and friends bring the holiday spirit back to life for families once again. Broadway Playhouse at Water Tower Place, 175 E. Chestnut St. The McCormick Tribune Ice Rink in Millennium Park kicks off the winter season with skating and special programming. Admission is free and open to the public, with skate rentals available for $12. Michigan Avenue between Washington Street and Madison Street. Although we have not had much snow yet, many festivities have happened here at Loyola University to ring in the holiday spirit! When you set foot on campus, you will see tons of fresh beautiful trees decorated with lights and ornaments as well as garland and wreaths. Without a doubt, when snow comes, our campus will look so beautiful. Last week, Loyola had their 2nd annual tree lighting in Damen! Along with the lights, Loyola students celebrated by skating on the synthetic ice rink located adjacent to the tree. Hot chocolate was served and Santa made his appearance! 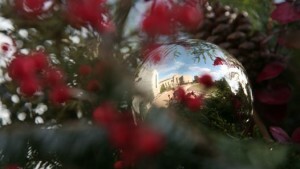 Holiday music was played and without a doubt, people enjoyed themselves and began to feel the spirit of Christmas. The day after that, LUC’s orchestra, jazz ensemble, and choir came together for their biggest concert, Joyola. Christmas songs were performed in unique melodies and harmonies- it is something I recommend seeing (for next year). Throughout the week, the Student Hub, located in Sullivan Center, had free hot chocolate available to the students! The people of the Hub wanted to wish the students well as they prepared for the finals in the upcoming week. On the weekend, Polar Palooza kicked off the holiday season by offering the residents of Rogers Park (and the general public), more synthetic ice skating, live music, hot chocolate, and a variety of vendors selling holiday nick-naks and food (of course). 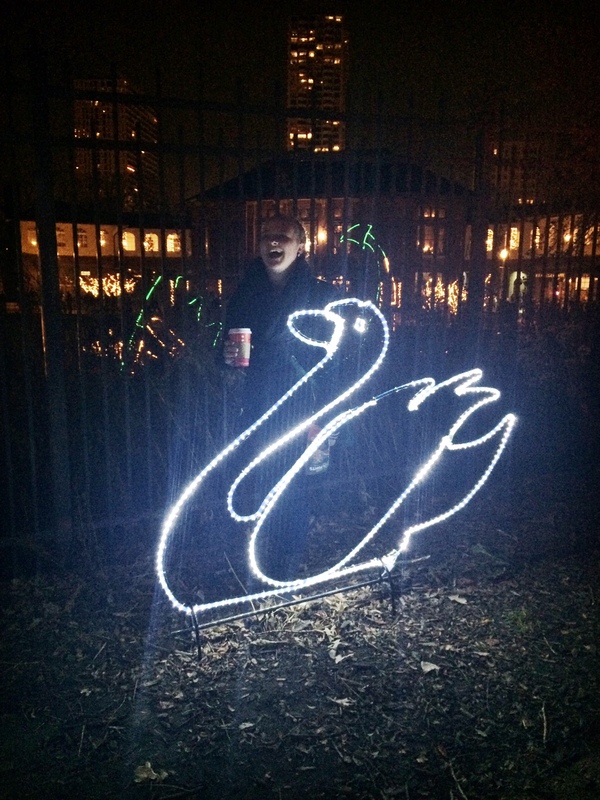 There’s a lot of fun things that happen around Loyola University! There’s always something to do and keep you on your feet and enjoying yourself. 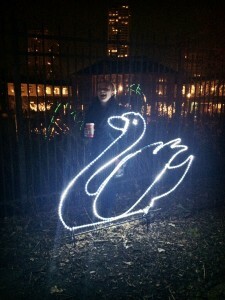 You’ll never get bored living in the city and the things that happen around Loyola University Chicago! all of the Ramblers back in their hometowns. Mom’s cooking for a month–say goodbye to your diet. who doesn’t love catching up with family and friends? But when we return we won’t stop talking. The Jesuits will have a Christmas celebration. if of course she ever takes a vacation. It’s hard to believe it’s the end of the year. and who will stand out among the masses. all their presents in tow. cheering for those points to grow. for a winning season all around. to bring home the victor’s crown. So from one rambler to the rest, I hope this Christmas was the best one yet! Christmas is finally here and what a day it has been! I love to see people smile, laugh, and ultimately be happy. I love to give presents out to people; it shows people that you thought about them and shows them that you care. Especially when I get presents, I do not think about how difficult it will be to get what people want or how much money it costs. To me, a simple “Thank you” or a hug is truly rewarding and worth it. Next year, I plan to do even more for people by volunteering more frequently at the hospital around this time of the year to help patients feel a sense of joy and closure. In addition, I would like to do more for my school community by passing out candy canes to Loyola students; I have encountered a couple of students this year who have given me candy canes and wished me a Merry Christmas and they have influenced me to do the same for next year. The Christmas season is all about showing kindness and joy to one another and I feel entitled to carry out that message and set a good example for others. Kindness is everything. Merry Christmas to all of you and I wish you a great start to the new year in the few days ahead of us! Since the start to my winter break, I have had the chance to go downtown a couple of times to see the beautiful lights wrapped around the trees, decorations in the store windows, holiday music in the malls, and little specks of snow falling down on our beautiful city of Chicago. Daley Plaza is filled with people ready to enjoy themselves by sampling a taste of German food and viewing the ornate craftsmanship of delicate, wooden ornaments and figurines. The city tree stands tall and every part of the tree is lit up with colorful lights of red, green, blue, and yellow. At Millennium Park, the Bean (Cloud Gate) reflects the cold, crisp white sky and showcases the view of the skyscrapers at an interesting angle. Below the Bean, my cousin and I had the wonderful opportunity to go ice skating; it was fun as people of all ages were present and gliding smoothly on the ice to the beat of the Christmas music blasted through the nearby speakers. All in all, there is so much to do in Chicago to celebrate the Holidays; things in this city never get old. Besides the usual things to do downtown, there are other places to see and visit such as Lincoln Park Zoo for their famous zoo lights, local malls, and grade school Christmas pageants. To top everything off, let’s wish for a very White Christmas! Christmas is coming up and here at Loyola, we have shown our holiday spirit in the most festive and decorative way. At every corner you turn (outside on campus), you will see gorgeous evergreen garland wrapped around each light post with a bright red bow to top it off, lights on trees, lights of red and green that shine upon the buildings at night, and so much more. Personally, I believe that the Damen Student Center is the most decorated- there is a colossal Christmas tree that reaches to the ceiling, there are wreaths at entrances, garlands with lights alongside the stair rails, and to top it all, there is Christmas music put on. It is breathtaking and so beautiful to see the decorations; it puts students into the holiday spirit and gives them a little bit of hope and happiness to push through their last couple of weeks of classes of the year. This week, Loyola will use the food court area in the center of Damen to build up a ice-skating rink for students to enjoy. When I first heard about a ice rink, I was shocked (but I am not complaining about it!). Loyola still knows how to surprise and impress me with that they can do. Besides the winter wonderland in Damen, there is an interesting nativity scene in front of the Mundelien building. It is not just a stable with the figures; other figures like the three kings and donkeys are all scattered on the grassy area near Mundelien (toward the lake). I am interested to see that else what other figures will pop up on campus and will visit that area often. All in all, I am happy that Loyola has done so much decorating! It changes things up for students. Now they are able to glimpse at something new and different and embrace the one amazing holiday that only comes once a year and with that, comes a month-long break! Loyola is absolutely amazing for so many reasons. Reason #27 (roughly) of why Loyola is the best: they give us one full month of winter break! I remember as a freshman I had mixed feelings about this long hiatus from my new college friends, but as a busy, busy senior, this long break was exactly what I needed. I would have to say the highlight of my break was seeing the love of my life, Justin Timberlake (yes, I am a crazy fangirl when it comes to him). He performed his 20/20 Experience tour in Cleveland the Thursday I got back. It was the perfect start to my break! He is a great performer and absolutely hilarious. The highlight of the show was when he sang happy birthday to a six year old in the audience! The whole week of Christmas I was surrounded by family, specifically my 20 cousins. I always have the most fun with them, so I was grateful that everyone was able to come together. My parents did Christmas a little different this year. Instead of buying my siblings and I specific gifts, they gave us money and a night to shop at the mall. My mom was getting tired of us returning everything she bought us (sorry we’re picky, mom!) so she thought this was the best solution. It was fun shopping with my parents and siblings, but the best part was enjoying a nice family dinner afterwards at Maggiano’s. The rest of my winter break was pretty low key. As you Chicagoans know, the -30 degree wind chill that lasted a few days was killer! It was so cold in Cleveland that our schools closed for four days! It was a nice extended break for the school age kids, and my mom, who is a teacher, but I was getting a little stir crazy being cooped up in my house. It was nice to relax and catch up on some television shows, though. My ride back to Chicago was great… I had two of my best friends from home come back with me! My friend Anne goes to Miami of Ohio and was visiting for the weekend, and my friend Tiffany goes to Columbia College Chicago! 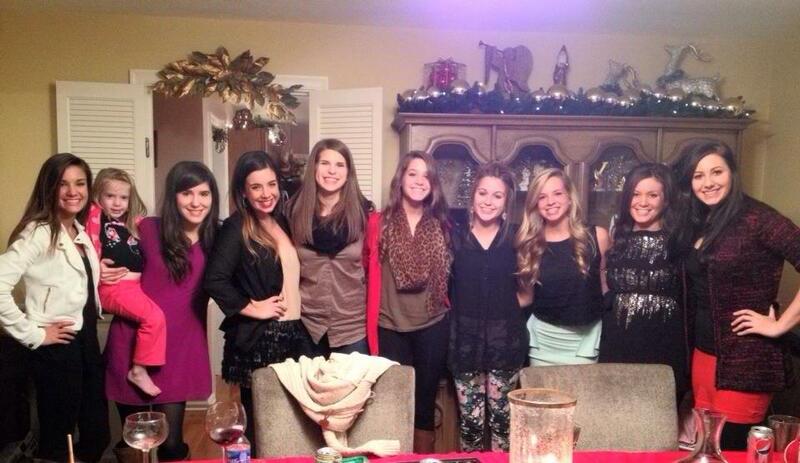 We had a great weekend together, and it was the perfect ending to my winter break! 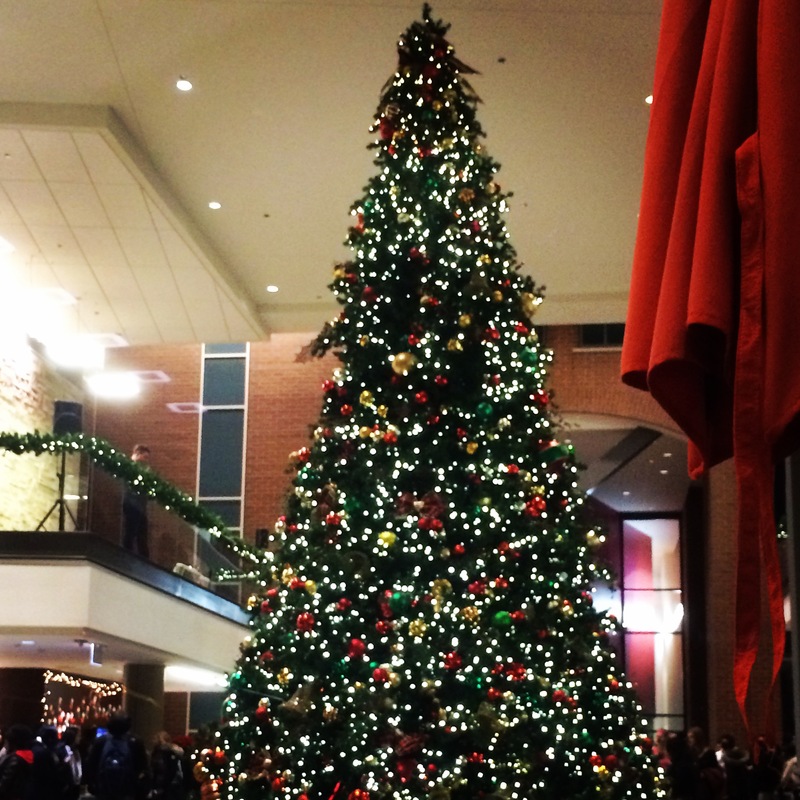 For those of you who haven’t heard, Christmas on Campus is back for another year at Loyola. It is an annual campus-wide Christmas event that aims to serve the children in the Chicago area. Clubs and organizations volunteer to sponsor activity tables in Gentile Area, while individual Loyola volunteers pair up with a child and take them around. The kids can enjoy all kinds of crafts and games like cookie decorating, letters to Santa, basketball with the Loyola players, and sitting on Santa’s lap. The event is super fun and a great way to get involved. The event organizers are currently looking for organizations and individual volunteers to help out. The event will take place on November 24 from 10:00 AM to 4:00 PM. Visit the Facebook page to see how to sign up! Christmas break was EXTREMELY relaxing! It was so nice to take a break from the mounds of schoolwork I usually have and just enjoy the company of family and friends while eating tons of home cooked meals (my favorite part!). One of the many perks of Loyola is that they give everyone a full month of break. 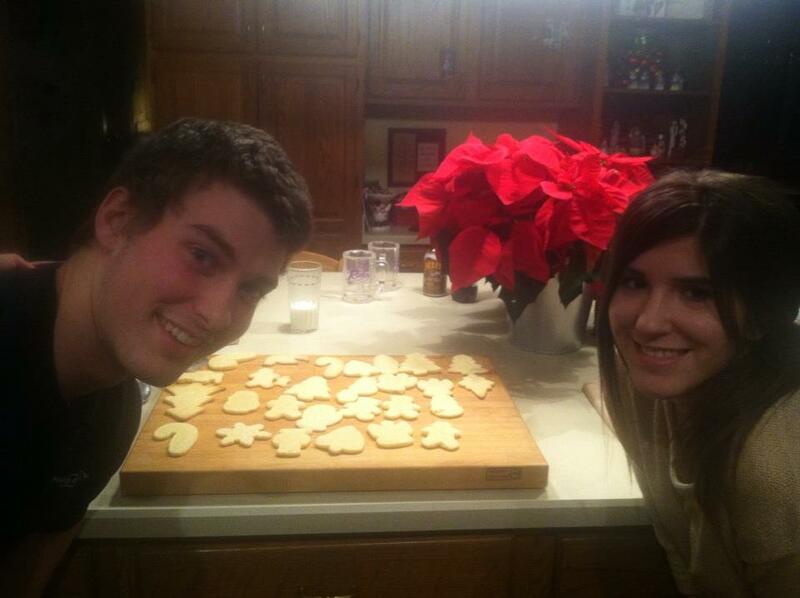 (Mostly everyone, depending on finals) I got home December 13th, and a few days later, my siblings and I hosted our first annual Trubiano siblings cookie making party. We each invited a few friends, and made a ton of cookies for Christmas and Christmas day… although most of them were gone that night. Here’s a picture of the cookies I was in charge of, before they were decorated. On Christmas Eve, my family has my moms whole side at our house. We ate delicious lasagna and exchanged presents. It was extra exciting this year because it was my cousin’s baby’s first Christmas. He is the chubbiest, cutest little thing. On Christmas day, we went to my grandparents house. My dad has five brothers and sisters, so there was a ton of people packed into the house. I have so many cousins, and I always love Christmas because I get to hang out with all of them at once! 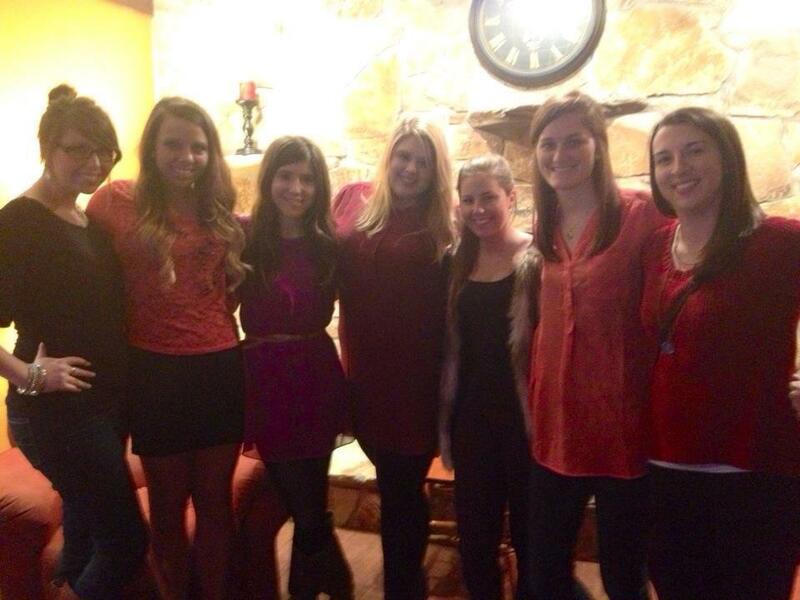 Here is a picture of all of my female cousins besides one. I spent a lot of time with my high school friends over this break as well. We had a lot of holiday parties and went to a lot of movies. (I highly recommend Silver Linings Playbook!) Here’s a pic of my six best friends. I definitely needed the long Christmas break. I was great spending time with family and old friends. It is great to be back in Chicago though, and I am really looking forward to this semester!